OK, so now you are really confused. If you are looking for a Keurig coffee machine that will make you an iced coffee from scratch, then this machine doesn’t yet exist. If you don’t mind a bit of manual labor, then you can brew your favorite coffee with any Keurig machine and then pour it over a tumbler of ice. 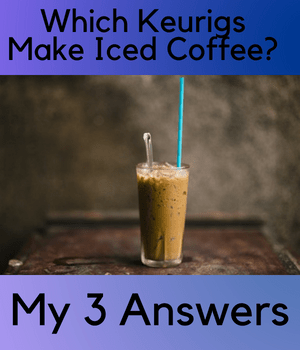 The trouble is with option 2 is that very often, no matter the strength or type of coffee that you brew, when it is poured over ice, it tends to disintegrate into a “watery mess” with the ice melting too quickly to boot. Enter the Keurig K Elite. Other Features: Iced Coffee, High Altitude, Auto On / Off, Smart Start. With its iced coffee button, this machine is a great choice for those of us who like our coffees iced, when the temperature starts to climb. The design is stylish and sleek and so that makes it a great choice for someone who wants a coffee machine to put on display- rather than buying a device that you really want to hide. You started by wanting to find out about which Keurig machines make iced coffee. Now, if you don’t like the K Elite, what are you other options? Well, as far as I see it you have three..
Find another great Keurig coffee machine, that doesn’t have a special “iced button”, but will make terrific coffee that you can pour over ice..
Make some cold brew coffee and add ice. Cold brew coffee is coffee that has been made by soaking coarse coffee grounds in water between 12 and 24 hours. Often it is confused with iced coffee, when the two things are completely different. Most importantly, cold brew coffee makes great iced coffee. How Does a Cold Brew Coffee Maker Work? Cold brew coffee makers come in many shapes and sizes but most of them work by immersing coarse ground coffee in water for between 12 and 24 hours before filtering the ground coffee out. A typical water to coffee ratio is 7:1 which means that for every liter of water you use 140g of coffee. At the end of the process a concentrated coffee is created. This coffee can be diluted with water, milk or cream. Many people use purpose built cold brew coffee makers but other people use everyday items to make their brew. Your third and final option in your quest for the perfect iced coffee is to brew it at home without any special equipment. All you need is a mason jar, a jug and a clean cloth. Watch the video below which will take you the process step by step.